The new year is upon us, and it’s time to start thinking about the rest of the cheerleading season. While many athletes are in the middle of their break, this is the perfect time to think about what they can improve on before the end of the season arrives. 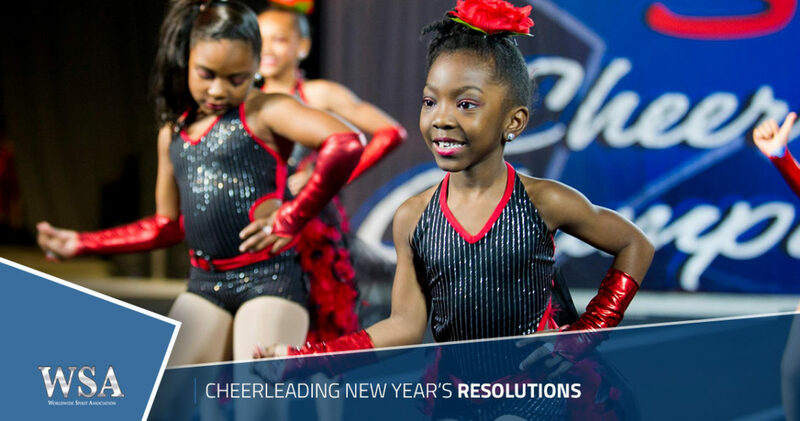 Get ready for tryouts, learn some new skills, and become better than ever with these cheerleading new year’s resolutions. We know some of you probably have incredible jumps, but chances are, most of you have some room to improve. Jumps seem to be the first skill that goes overlooked. After all, as long as your feet leave the ground, it counts, right? Great jumps are oftentimes the difference between first place and second place. Those technique scores can hit you hard, and those habits are challenging to change. What you can do: We recommend videoing yourself performing your jump sequence, as well as individual jumps. Look at them in slow motion. Where are your arms placed? Are your toes pointed? Find out what’s wrong with your jumps and focus on fixing the details. You may be thinking “my resolution is to get harder tumbling,” but we have another suggestion in mind. Athletes usually have a tough time progressing in their tumbling because they don’t have the right technique just yet. If you aren’t landing with your arms by your ears in a roundoff, how hard is it to connect that to another skill? Answer: It’s extremely difficult. Fixing these minor details and ingraining these proper habits is a must for anyone who wants to throw harder tumbling safely and beautifully. What you can do: Ask your coach what you need to work on, then ask for drills you can do at home to fix those issues. Little habits can be changed even without actually tumbling. The more you practice, the more likely you are to create new, proper habits that override your bad ones. Whether your teammates are your best friends in the whole world, or you are more of a loner, they are still your team. You cannot succeed unless you trust them and they trust you in return. A wonderful new year’s resolution is to spend more time with your team. Consider suggesting team bonding activities to do together. What you can do: Ask your parents if you can host a cheer party at your house, complete with games and yummy snacks. Volunteer with your team for a charity event. Create a team handshake or dance you do every time you perform a full out. No matter what you do, creating a deeper bond is crucial for making the most out of the cheer season. The year is coming to an end and 2019 is upon us! We hope you achieve your resolutions, no matter what they may be. From all of us to you, happy holidays and may your year be filled with cheer. The WSA staff can’t wait to see you at our next cheerleading competition!